Offering feedback when the news isn’t so positive can be difficult. We can reduce the stress by implementing a few critical steps. The first three steps I introduced in my video “Feedback that works”. CHANGE YOUR MINDSET – Instead of telling yourself this is going to be a difficult conversation, replace that thought with the idea that you are helping someone improve their performance versus holding them back. REMEMBER YOUR ROLE AS A LEADER – Is to improve company performance and that comes through delivering coaching and feedback. BALANCE YOUR FEEDBACK – People are much more inclined to hear difficult news and take action when it is not the only message they hear. They need to know from you what is going well. PREPARE FOR THE CONVERSATION – Never go into a feedback conversation without having thought through what you are going to say, what reaction you expect to get, and how you will respond. I suggest rehearsing the conversation ahead of time. SPEAK OBJECTIVELY – If for any reason you are feeling angry, hurt, or emotionally upset, wait until these emotions cease before having the conversation. a. The SITUATION – about which you are offering feedback. For example. “In our project meeting last Thursday”, or “In the e-mail response to the CIO on March 22nd”. b. The BEHAVIOR – what the person did. For example, “You interrupted Robert and Elizabeth several times and dismissed their suggestions” or “You didn’t answer the CIO’s questions in your e-mail”. Be sure to be ready to share specific examples that will help the other person understand what they ‘did’. Also, try to avoid including your perception. Perceptions come through our life experiences and can be interpreted differently so you don’t want to debate over the way you viewed something versus someone else. Stick to the facts and focus on the behavior. c. The IMPACT – Explain the impact that the other person’s behavior had on you, another person, or the group, etc. For example, “Robert came to me after the meeting and said he was not willing to partner with you until some things changed”, or “By not answering the CIO’s questions in your e-mail, I received a call from her and she stated she was upset that she didn’t get a clear response in time for her meeting with the CEO”, or “The way you are treating people are impacting the way they are working with our group. I’d like to see how you can improve your interactions with others”. BUILD TRUSTING RELATIONSHIPS – Along your career so that when you do need to offer feedback you have that relationship to fall back on. This doesn’t happen in one meeting or brief interaction at the water-cooler. It entails engaging in conversations that include talking about the overall needs of the business, their needs and your needs. Giving effective feedback is both a science and an art. Successfully leaders have both. If you would like assistance in developing your leadership skills, please contact The C3 Group at www.TheC3Group.us. How Do I Know if a Mid-Life Career Change is Right for Me? the first thing you have to do is wake up. Find yourself frequently bored at your job? Caught yourself daydreaming about doing something different? It’s not uncommon for professionals to find themselves at the mid-point in their career imagining doing something else even if they are highly successful and proficient in their occupation. Sometimes the boredom is a brief encounter and when the next big project or challenging assignment comes along, the leader is re-engaged. For others though the lingering continues, leaving the leader feeling perplexed. they still have many years of work ahead of them? As an Executive Coach and Psychotherapist, I have learned that the bigger questions about life that surface should not be rejected. These queries are coming from a deeper place, sometimes unknown to our conscious selves. These urges usually surface subtly and can be quickly overlooked or denied. This is where curiosity as a leader can be extremely useful. Instead of dismissing these thoughts or feelings, explore them. Anyone who quickly rejects them is missing out on an opportunity to grow. Even if you stay in your current career, you still have an opportunity to learn something new. You should follow in your father’s footsteps and be a lawyer. Careers in the health and financial industry are the most dependable. You should be more like your brother and get a PH.D.
All of these statements could have a bit of truth in them, and were probably delivered with positive intent. However, it is only in the second half of life that we have the opportunity to rewrite the script that fits our true selves. The second half of life provides a shot at getting ourselves back again by engaging a larger world, one more complex, less safe, and more challenging. Begin jotting down your thoughts, ideas and emotions. This step honors the part of yourself that is sometimes outside the range of consciousness, but knows what is right for us and is reporting to us via our bodies, emotions, and dreams. Share your ideas with a close friend who will allow you to think out loud without a lot of advice and will keep your conversation confidential. Consider working with a Coach who is trained in self-examination and self-reflection. If you are just exploring the possibility of making a change, you need someone who can help you identify what these thoughts and feelings really mean, not build your resume. Engage in this process sooner than later. If your wiser self knows that a change is needed, you don’t want to wait until a crisis occurs in your career. Start the process now even if you don’t make a change for three or five years. You will feel more confident and prepared to make the transition once you are ready. The era we are in where exertion has replaced thought and the trance of busyness has overcome millions will eventually be a thing of the past. We are already starting to see the shift happen as we see masses of people flock to mindfulness training, yoga workshops and other centering activities as they come to realize this pace is no longer sustainable. 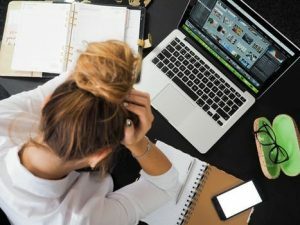 So, how do we overcome the age of overload at work where acting busy and over stimulation is worn as a badge of honor? Start by incorporating white space into your day. White space is a pause taken between activities. It brings you back to the present, giving your brain a chance to reboot before rushing on to the next activity. It takes a matter of seconds or a minute or two at most. I call it a ‘micro move’ like an adjustment a golfer makes to a putting stroke. The alteration can be minor, but the effects quite significant. A few years ago, I was leading an enterprise-wide leadership development program where we incorporated white space at the beginning of the training. At first, I was a bit nervous at what leaders might think, but they were appreciative of the intermission between events. It was like watching thirty leaders come up for air after holding their breath under water for a long time. I could see a physical shift in their bodies and expression of relief. Following the two-and-half day training, per the leader’s request, we continued to incorporate white space into their group coaching sessions, calling it, “The 60 second pause”. How does White Space Work? So, once you take that pause, ask a provoking question to challenge if what you are doing is most important. Don’t succumb to what you always did or you’ll get what you always got. Mastery of the human element of busyness is probably the biggest difference between a smart guy and a leader. Is White Space the Same as Mindfulness? White space” and mindfulness have similar effects on our overall well-being, and practiced together they can be powerful because they build our brain’s capacity to be more present, but they are different practices. White space is a brief second or moment pause between events used to recuperate, decompress and refocus, or process new information before rushing on to the next event. It requires challenging old beliefs about what it means to be productive. Mindfulness, according to Ellen Langer, Harvard Psychologist, “Is the state of mind in which we are actively engaged in the present noticing new things and sensitive to the context.” Being engaged in the present moment cultivates our ability to see a situation differently or consider a different perspective and be more accepting. Due to our continuous partial attention on our work and spending over half our days on average consuming media, staying fully present takes practice, so most people seek out white space and mindfulness training to gain greater proficiency. If you would like more information please contact me at: Marcel@TheC3Group.us.